The new ECTACO Partner SC500T is a bilingual Chinese - Spanish - Chinese translating dictionary and so much more. Designed to let anyone understand and communicate instantly the SC500T features all the latest programming advances. The new ECTACO Partner SC500T is a bilingual Chinese - Spanish - Chinese translating dictionary and so much more. Designed to let anyone understand and communicate instantly the SC500T features all the latest programming advances. Containing a massive 35 000 words in its comprehensive vocabulary database plus 14 000 of the most important phrases for immediate communication the SC500T employs sophisticated Chinese and Spanish TTS (Text-To-Speech) voice synthesis to speak any of its entries aloud so you do not have to. SAT 200 and SAT 5000 vocabularies help those preparing for tough standardized college-entry tests by building a winning vocabulary quickly and accurately. Add in popular American idioms a full Chinese grammar resource with irregular verbs and enjoyable linguistic games to improve your skills while you play. Employing the latest Chinese and Spanish TTS speech synthesis to deliver complete pronunciation of all the entries in the SC500T database. Just touch a button and let the SC500T do the talking for you. 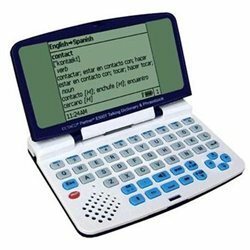 The device also features an advanced Look-up function and a Word Recognition utility plus the award-winning Vector Ultima spell-checker to ensure accuracy. The SC500T also comes pre-loaded with loads of extras usually found in the most sophisticated business organizers. Use the World Time utility and take charge of your finances with the built-in calculator. Currency and metric converters. The Partner SC500T includes: Chinese Interface Advanced Chinese speech synthesis pronounces any word Chinese Phonetic transcription Instant reverse translation Advanced word recognition Vector Ultima spell-checker Slang Lock feature to exclude slang from translations Chinese Irregular verbs American Chinese Idioms Electronic Chinese grammar book Linguistic games World Time clock Currency and Metric converters.